Charles Schulz created some of the most popular characters of all time. Here are some of the products available through Amazon.com or their partners. This is not yet a complete list, but I'm adding products to the list daily. If you wish to purchase any of these items, click on either the title or the picture to be directed to Amazon.com. As a warning, I have put up pictures to give you somewhat an idea of the style of each product so the pages may load slowly, depending on the speed of your internet connection. Feel free to browse around. The same links are located on the left side of your screen. To return back to this page, simply click on the "Welcome" link on the left. For the videos that most of these Peanuts books have been based on, go to the Peanuts Holiday Videos Page. For more children's books, go to the Peanuts Books for Kids Page. For archives of Peanuts comic strips, go to the Peanuts Comic Books Page. For more Christmas Items, go to the Disney Christmas Books, Disney Christmas Music, Disney Christmas Videos, or Disney Christmas Toys and Gifts Pages or the Sesame Street Christmas Page. This half-hour Christmas show is one of the truly lovable animated specials in TV history, a status proved by its annual network telecast since 1965. A Charlie Brown Christmas was the first, and best, of a series of programs based on the Charles M. Schulz cartoon strip "Peanuts." Hapless hero Charlie Brown finds himself depressed at Christmastime, searching for the true meaning of the holiday amidst the glitz and commercialism of the modern age. Appointed director of the school holiday pageant, Charlie Brown ventures out with Linus to buy "a great, big, shiny aluminum Christmas tree." Instead they bring back a miserable tree--a real one. A Charlie Brown Christmas shows off the "Peanuts" gang doing what they do best: Lucy is bossy, Snoopy is crazy, Linus is sweet, and Pig Pen is, well, filthy. Instead of using adult actors trying to sound like kids, the production features real children providing the voices, an endearing effect. The jazz music score, composed by Vince Guaraldi, has become a classic in its own right; like so much about this program, it's an unexpected but perfectly right choice. Snow on the ground, goodwill in the air and - good grief! - another Christmas play to perform! Two of the all-time cartoon classics It's the Great Pumpkin, Charlie Brown (1966) and A Charlie Brown Christmas (a Peabody and Emmy winner from 1965) highlight this three-disc, six-episode set. Although the DVDs contain no extras (good grief!) and could have been combined on a single disc (drat! ), the collection looks and sounds wonderful on DVD. The content is the same on the VHS and DVD sets, with two episodes per tape or disc. Accompanying Pumpkin is You're Not Elected, Charlie Brown, a cute spin on politics that has aged very well since its 1972 release. Christmas sports a lackluster sequel of sorts, It's Christmas Time Again, Charlie Brown (1992) that has Sally dwelling on getting (instead of giving), Charlie Brown facing a spending dilemma, and everyone suffering stage fright before the annual school play. A Charlie Brown Thanksgiving (1973) also won an Emmy but is not as well known as others; it also suffers from not having the original cast. Snoopy is foremost in helping to put on an impromptu feast (toast and popcorn) as the gang keeps forgetting the true meaning of the holiday. Also on the disc is a better Thanksgiving venue, The Mayflower Voyages (1988), part of the This is America, Charlie Brown series that breathed new life into the franchise. Mostly narrated by Linus, the show traces the Pilgrims' plight and doesn't talk down to youngsters on the hardships they faced. It's a treasure of a gift (for others or yourself), all nicely packaged. By Lenox Since 1889, Lenox has created distinct tableware collections, beautiful hand blown crystal, and unique giftware and collectible items. Included in this medley of products, Lenox has captured the essence of the holiday season by crafting personalized and annual Christmas tree ornaments that make perfect festive presents and add cheer to any holiday tree. This charming 1-3/4- by 3- by 3-inch ornament is the perfect gift for a new homeowner, a loved one, or an out-of-town relative celebrating the holiday season. The second ornament in the series, a cheery Snoopy dressed up as Santa and his trusty companion Woodstock tote a sack full of presents adding holiday cheer to the darkest winter's day. Crafted from fine china, this jolly duo is decorated with a handpainted glaze that covers Snoopy's bright red hat and coat, Woodstock's matching hat, and the presents in the overflowing bag. Gold embellishments decorate Snoopy's belt and the bag of presents, while a tassel cord attached to the top of the ornament allows the decoration to be placed on a holiday tree. Crafted from handpainted Lenox ivory fine china and accented with 24 carat gold embellishments. By Lenox This favorite Peanuts character is reproduced in fine crystal in this ornament from Lenox. As cute as ever, Snoopy appears to dance a jig as he dangles a string of colored Christmas tree lights between his paws. Sure to delight either a child or adult, the ornament makes a pleasing whimsical change from the usual holiday themes. A silver-toned tassel cord is attached to the 2-1/2-inch ornament to enable it to be hung from a tree, window, car rear-view mirror, or anywhere a smile is required. On the cord is a silver-plated tag of authenticity engraved with the renowned Lenox name. The Snoopy ornament comes nestled on red flocking in a clear gift box, which also stores it safely for holiday seasons to come. By Lenox Ideal for the cookie lover or Peanuts fan on the list, this whimsical holiday jar inspired by Charles M. Schultz's classic cartoon easily accommodates several dozen baked treats and promises to delight. The two-piece ensemble measures 12-1/2 by 8-1/2 by 9-1/2 inches and includes a lid and a rectangular base with a large opening for easy access. With a familiarity recognized worldwide, the piece is formed in the shape of Snoopy's doghouse with the inhabitant resting atop its roof. Festive strings of red, apple green, and dark green lights charmingly decorate the house in haphazard fashion. Touches of gold and glitter integrate into the design for added sparkle while underneath rests a glossy base made of fine ivory china. To preserve the gold and glitter detail, hand washing with warm water is recommended. By Lenox Serve up a festive round of wintertime tea with this Charlie Brown-themed teapot in the Snoopy's Christmas pattern from Lenox. Busy building a jaunty snowman (the teapot), Brown rolls a snowball while Snoopy balances atop another. Both are comically dressed in Santa suits for a positively jolly Christmastime motif. With two eyes made out of coal, a mittened hand for a spout, a lid made out of the snowman's hilarious hat, and a broom for the teapot's handle, this festive scene brings the laughs to holiday tea. Detailed sculpting and careful hand painting add convincing dimension as the animated duo plays in the snow. Crafted of durable earthenware, this 11-3/16-inch, 80-ounce teapot is safe in the dishwasher for easy cleaning. 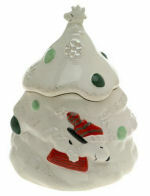 By Lenox Serve up festive breads, spreads, and cheeses on this Charlie Brown-themed canap� dish in the Snoopy's Christmas pattern from Lenox. Busy under the tree, Brown wraps a gift while Snoopy, who's comically dressed in a Santa suit, decorates the tree for a positively jolly Christmastime motif. Scalloped edges are adorned with red and green lights and accented with 24-karat gold. Detailed sculpting and careful hand painting add convincing dimension as the animated duo prepares for Christmas Eve. Crafted of Lenox ivory fine china, this 7-3/4- by 7-1/3-inch canap� dish is safe in the dishwasher for easy cleaning. By Lenox Ideal for the chef or Peanuts fan on the list, this whimsical holiday duo inspired by Charles M. Schultz's classic cartoon promises to delight. The two-piece salt and pepper set includes a three-holed shaker depicting Snoopy trimming a holiday tree and its partner, a gift-bearing Charlie Brown. Each canister measures 2-1/2 by 3-1/4 inches and features a removable plastic insert at its base for easy refilling. Made of hand-painted fine ivory china, the color detail includes dark green, apple green, and red with accents in gold and glitter. For the collector, additional holiday Snoopy pieces are available for purchase. To preserve the gold and glitter detail, hand washing with warm water is recommended. By Pugster Snoopy and Woodstock take a snooze on the dog house after they have finished decorating it for Christmas on this cute Peanuts charm . Authenticated by Casa D'Oro from Pugster inc. Designed to fit most charm bracelets. By Pugster Snoopy ice skates by dressed as Santa on this cute Peanuts charm . Authenticated by Casa D'Oro from Pugster inc. Designed to fit most charm bracelets. By Pugster Woodstock dresses up as Santa on this cute Peanuts charm . Authenticated by Casa D'Oro from Pugster inc. Designed to fit most charm bracelets. By Pugster Charlie Brown looks excited as he begins to open his Christmas present on this cute Peanuts charm. Authenticated by Casa D'Oro from Pugster inc. Designed to fit most charm bracelets. By Playing Mantis Collect the entire Peanuts Gang from the television classic "A Charlie Brown Christmas." Recreate your favorite moments from the Christmas holiday special with these action figures and accessories. By Playing Mantis This boxed set includes Charlie Brown, Linus Van Pelt, Sally Brown, Lucy Van Pelt, Schroeder and Pig Pen from the Classic TV show. By Playing Mantis Snoopy's Contest Winning doghouse playset features flashing lights, a snow covered fence backdrop, a box of leftover decorations and his dog dish full of bones. Press the "First Prize" Ribbon to activate the lights and sounds! Just like It's the Great Pumpkin, Charlie Brown and A Charlie Brown Valentine, this illustrated read-along seeks to re-create the popular Peanuts TV show of the same name. This edition also includes a four-song sampler CD from jazz-great Vince Guaraldi's brilliant soundtrack. With illustrator Paige Braddock aping Charles Schulz's style, A Charlie Brown Christmas retells the Emmy Award-winning program blow-by-blow (with a few omissions), from the ice-skating opening scene to preparations for the school pageant to Charlie Brown's ill-fated Christmas tree rescue. Braddock almost perfectly mimics the show's cast and backdrops, but just as no one could be fooled by even expert impersonation of a loved one, Peanuts fans might find the niggling differences distracting (whether it's Schroeder's too-wavy hair or Pig Pen's just-too-small head). A "novelization" like this probably can't ever hope to completely recapture the charm of the original, even if it had used Schulz's original art. Although the dialogue has been faithfully reproduced, much of the story's subtle appeal and cultural subtext gets lost in the book's simplified exposition--which is too bad, given that these are precisely the qualities which have made the show (and Schulz's timeless strip) so durable and well-loved in the first place. A Charlie Brown Christmas: The Making of a Tradition Since its top-rated debut on CBS in December 1965, A Charlie Brown Christmas has been one of America's most beloved television shows. Year after year, fans of all ages tune in to the Emmy-winning Christmas special that has earned a permanent place in the nation's popular culture. 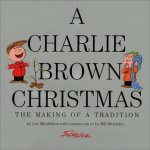 This collector's treasury contains the entire script of A Charlie Brown Christmas, illustrated with full-color stills from the animated film. Producer Lee Mendelson and animator Bill Melendez pay tribute to the program with personal memories and reflections about the show, including charming anecdotes about their long friendship and working career with Peanuts creator Charles M. Schulz. Offering rare, behind-the-scenes insights, they also share memories of the late, great jazz pianist/composer Vince Guaraldi and provide never-before-published background sketches, storyboards, production sheets, and other materials that bring the making of the show to life. A Charlie Brown Christmas: The Making of a Tradition also brings the sound of the show home with the piano/vocal musical scores for Guaraldi's "Christmas Time Is Here" and "Linus and Lucy," two songs that have become standards of American popular music. As the very first Peanuts special, A Charlie Brown Christmas brought Charlie Brown, Linus, Lucy, Snoopy, and the rest of the gang to television. In addition to breaking the mold by using jazz music (which exposed millions of people to jazz for the first time and inspired a generation of jazz pianists), A Charlie Brown Christmas broke new ground by using real children for the voices instead of adult actors. Schulz, Mendelson, and Melendez created these and other innovations that made A Charlie Brown Christmas a unique and timeless work of animation art. A Charlie Brown Christmas: The Making of a Tradition celebrates this award-winning and history-making show with warmhearted memories, fascinating trivia, and colorful animation art that will delight fans of all ages. A Peanuts Christmas It�s Christmas time, Charlie Brown! Christmas is a joyous time of year�and what could be more fun than sharing it with dear friends? Celebrate the season with the Peanuts characters you�ve loved so long. Sing carols with Charlie Brown and company around Schroeder�s piano. See Snoopy�s festively decorated doghouse. Find out if Lucy�s been naughty or nice. Discover if snow has any effect on Pig Pen�s �aura.� And learn about the true meaning of Christmas with Linus. Just in time for the holiday season, A Peanuts Christmas is the complete collection of Christmas strips from 1950 to 1999. For the first time ever this delightful book brings together nearly fifty years of comfort and joy with Charlie Brown, Snoopy, and the rest of the gang. Push the button and join the fun! Embodying the signature Peanuts holiday spirit, everybody's favorite beagle, Snoopy, decorates his very own Christmas tree to the tune of "O Christmas Tree." Sally wants a Christmas tree, but has no idea how to cut one down, so when the perfect one falls down in her neighbor's yard, she is delighted, until the boy next door accuses her of stealing his tree. Sally Brown is convinced she's going to forget her one line in the Christmas Pageant, but practice makes perfect ... or does it? A heartwarming Christmas story with a side-splitting twist ending, Sally's Christmas Play carries on in the winning tradition of Sally's Christmas Miracle and Happy Valentine's Day, Sweet Babboo. Memories and Mistletoe: A Christmas Keepsake Album The holidays are a time for parties, getting together with friends, and reuniting with family. Let Snoopy and the whole Peanuts gang keep you organized for the whole season. There's plenty of space to write about your favorite moments, convenient side pockets to save special cards and photos, a recipe section to record delicious dishes and cookiesthere's even a seating chart to help you plan that big dinner! Your Christmas memories will be captured forever in this handy keepsake album to enjoy over and over again once the holidays have passed. It's Christmas! Nothing can top the thrill of waking up on Christmas morning eager to begin a day of celebration. And no one knows how to celebrate better than the Peanuts gang! This delightful collection brings all the fun and excitement of the holidays to life as our favorite characters welcome Christmas into their homes...and doghouses...and warm little nests. Bah, Humbug! Those who love, dread, or find why humor in holidays will relate to the Festive Peanuts series in which Snoopy, Charlie Brown, Lucy, Linus, Woodstock, et al., alternately celebrate, whine about, revel in, and find ways to survive Christmas and birthdays. Tis the Season to Be Crabby Festive decorations! (No time to shop.) Holiday parties! (Ten extra pounds.) The perfect gift! (Is it over yet?!). Yes, the holidays are fun but no one can sustain the Christmas spirit twenty-four hours a day! Laugh off the holiday grouchies with this collection of classic Peanuts strips celebrating the lovable Scrooge inside us all. Lighten Up, It's Christmas! It's Christmas! The Peanuts gang has started writing cards, making a list for Santa, and pondering how to get past Santa's secretary. Join in the fun, excitement, and the hilarious dilemmas of holiday planning and activities with Charlie Brown and his very merry Christmas crowd. Season's Greetings! Who can resist the holiday spirit when Snoopy dons his Santa suit? Ring in the holidays with Charlie Brown and the whole gang as they deck the halls with laughter and good cheer in this collection of Yuletide classics celebrating the excitement and anticipation that make Christmas time so much fun. Also includes pages of Peanuts line art. Charlie Brown's Holiday Hits Recognizing that the holiday season really begins at Halloween (and, in some quarters, doesn't end until the Super Bowl), Vince Guaraldi and his record company have wisely assembled the hummable themes from various Charlie Brown TV specials. What we have here is the album's ability to communicate the playful irony and loopy, lovable characters that people Charles Schulz's "Peanuts" comic strip every week. Though only one actual Christmas tune is included--"Christmas Time Is Here," in both the vocal and instrumental versions--kids from ages 1 to 92 will still appreciate the "Great Pumpkin Waltz," the "Thanksgiving Theme," oddities such as "Heartburn Waltz" and "Joe Cool," and, of course, the "Charlie Brown Theme." A Charlie Brown Christmas: The Original Sound Track Recording Of The CBS Television Special The first time you listen to this disc you will undoubtedly be transported directly back to your childhood. Charles Schulz's Peanuts characters will go toe-tapping and funky-dancing through your mind's eye. Play it a few more times, though (ignoring the dialogue snippets, if you can), and you will begin to truly revel in Guaraldi's wonderful, humorous, deep piano playing. You'll hear why he's such an influence on new age ivory tickler George Winston, but you'll also realize that Winston's holiday music never quite sparkles with the underlying passion, and humor, that twinkles in these grooves. Buy it for the nostalgia--keep it because it will remain one of the most enchanting albums in your holiday collection. By Cyrus Chestnut Jazz pianist Cyrus Chestnut knows a good thing when he hears it, and the music of A Charlie Brown Christmas, set forth so eloquently by the Vince Guaraldi Trio decades ago, is one of them. The pianist is backed here by a bevy of New York's premier session players and jazz stars: drummer Steve Gadd; ace sax players Michael Brecker, Kenny Garrett, and Steve Cole; and guitarist Pat Martino. Chestnut proves as inventive as always, playing with lighthearted wit and lyrical sophistication. He captures the whimsy of such Peanuts classics as "Skating" and the winning interplay of "Linus and Lucy," delightfully mixing it up with Martino's guitar figures. Chestnut also pays fond homage to the whole Peanuts gang with his memorable opening solo, "Me and Charlie Brown." Joined by Vanessa Williams and the Boys Choir of Harlem on "Christmas Time Is Here," Chestnut and company work their understated magic on this and other traditional fare. Somewhere, Charles Schulz is nodding his head in time to these lovely tunes and updates.